Sick of headphones that fall out, hurt, or need constant adjusting? 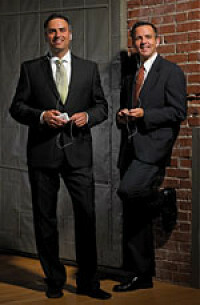 So were Seth Burgett and Richard Daniels, founders of Yurbuds. Seth is an avid triathlete, and Richard has completed more than 20 marathons. After too many workouts distracted by the pain of ill-fitting earbuds, the two partners started studying the shape of human ears and working with audiologists so they could develop just the right ergonomic forms to comfortably and securely fit a range of sizes. Yurbuds Ironman earphones are made from soft, medical grade silicone that’s comfortable and protects the inner electronics from perspiration, rain, and humidity. You don’t have to be an athlete to appreciate the high quality sound and deep, rich acoustics. Anyone on the move -- runners, hikers, walkers, strollers -- won’t miss another beat because of slippery, sweaty or uncomfortable earbuds. Daily Grommet-ers, lend me your ears! I am Daniel DeVille, employee number one, and Senior Sales Manager of Yurbuds. I have the distinct pleasure of introducing you to the best sports/active earphones on the market! I'll be here all day to do my best to answer any questions you may have about our company, products, & life in general! We are a company of runners, cyclists, climbers, hikers, skiers, triathletes, gym rats, so we are full of energy and passion. We hope you'll join in the fun and learn more about what has made us a staple for so many people world-wide! Thanks for joining us today! @Tina: These could be your solution! I will let Daniel expand on my response, but they stay in due to a combination of the soft silicone material used and the shape of the bud itself. I love watching that guy shake his head. There is no way my current buds could do that. Each time we have featured an innovative new earbud product the same question comes up "will it stay in during a workout?" This is a great product for all of the active Grommet-ers who have been long searching for a solution. Thanks Katherine for the initial answer! Our earphones stay in due to our attention to detail. We are the first earphone to use the shape and contour of your ear to keep them locked into place, while remaining comfortable for hours on end! As Katherine said, the material is a soft, tack silicone, that really grips the ear! We hope you love them as much as we do! These sound like they could be great for me, but I was wondering about the size. I think my ears must be really small even compared to other women because earbuds usually hurt me a lot. Have you tried these on women with small ears, or even kids? @Sharky : Between the two sizes in the package, our product will work for about 99% of the USA population, including kids and small-ear'd women :-). You should be more than happy with the smaller of the two sizes. If you have ANY trouble, please just contact us and we will get you the right size. @Daniel DeVille: I got mine in the mail this morning and tried them on with 100% skepticism on them fitting. I have some ear problems and my otolaryngologist has to use the pediatric instruments on my ears so I was positive that I'd be sending them back. The last pair of ear buds I bought had "tiny" size and they stayed in only if I held really still. I absolutely LOVE LOVE LOVE Yurbuds!!! They go in my ears and actually stay there and they don't hurt at all! I'm so very glad I took the risk. A thousand thank yous for this product. @Victoria: We are so happy that you are happy with your purchase. I will make sure that Daniel hears the positive feedback as well. Thanks for stopping back to let us know. @Victoria: Thank you so much for the glowing review! We are thrilled that you have found such a great solution to your earbud woes. We hope you'll join us as a fan on Facebook and recommend us, and Daily Grommet, to your friends and family! Thanks again, and happy listening! @Daniel DeVille: Two new Daily Grommet 'members' and at least two sets of Yurbuds ordered due to me not shutting up about them. On my way to spread the love on Facebook! @Victoria: Thanks for spreading the good word Victoria! Do these earbuds have controls (volume and switching from music to phone) built into them for use with an iPhone? @Keith MacKechnie: Hey Keith, this product does not have volume control intregrated into the cord. I use an adapter available on Amazon.com for these that allows me them to function in that way. It keeps the 3 button function out of the range of my sweat! I need a set of earbuds with just one plug. I deliver mail. I love to listen to my i-pod, but can only keep a bud in my left ear. I sit on the right hand side of the vehicle. I have to keep my right ear open. I have been buying cheap earphones and cutting one off. I would like to buy a quality set with just one plug. I think there is a market for this out there. Would you be interested in pursuing this? @Julie: Great suggestion! In the meantime, if we come across one we'll let you know. Thanks for letting us know about your specific product challenge. @Julie: Hey Julie, MANY of our users only use our product in one ear. We have many enthusiastic customers who are runners, cyclists, etc who want to be FULLY aware of their surroundings. Our products stay in so well, that even when you are only using one ear, they will NOT fall out and will be comfortable, even if you wear them your entire work day. My husband desperately needs really good hands-free mobile phone earphones - so earphones with a phone speaker on them. Do you make those? Or alternatively, you mentioned something on Amazon that adds volume control - is there something like that which adds a speaker? Can you point me to a good brand or type of adapter? @Michelle Ling: Hey Michelle, I'm not sure if there is any adapter that adds a microphone, I just know of the one for volume/track control. My experience is that most smart phones will work well with our standard earphones, as long as the phone is not in your pocket. I use my Yurbuds Ironman Series at the office all the time as a hands free solution. @Daniel DeVille: So ... does it have a microphone for phone convo's or not? @Sherry: It does not have a built in microphone or track control. However, as long as the phone is not in your pocket the Yurbuds Ironman Series work very similarly to the earbuds that have the microphone built it. I use them for phone calls at work and in the car daily. @Sherry: It does NOT have a microphone as part of the earphone, but smart phones are "smart". When an earphone is plugged in, the microphone on a smart phone turns to "speaker-phone" mode to draw in more sound and capture your voice. That's why I've enjoyed them with my iPhone. I hope this makes sense! @Irene Atencio: It's not a noise canceling device but the fact that it will comfortably stay in your ears during your workout (and not continually be on the verge of falling out) goes a long way towards allowing you to tune out those outside distractions. @Irene Atencio: Hey Irene, thanks for the question! It is not a noise-cancelling headphone. As you said, most people who are using our product are using it for physical activity. They enjoy being able to hear outside noise so that they can be safer while they are running/working out/cycling/etc with them. With a certain combination of positioning in the ear and volume level, they can block a decent amount of outside noise, but they will not be noise canceling. I hope this helps! My problem is sweat. I've tried just about every ear bud, I got from running to weights to a behind the head band does not work for me. Sweat gets into the ear, the buds get loose and eventually cut out the sound. Will these hold up in a sweaty ear? @Brian Clemens: I have forwarded your question on to Daniel and will let you know what he says. Thanks! The yur buds finally arrived. 86 degrees and about 95% humidity here in northern Indiana, it was the perfect environment for a test. Normally during a 4 mile jog, I have to adjust my ear buds several times or take them out to dry them off. 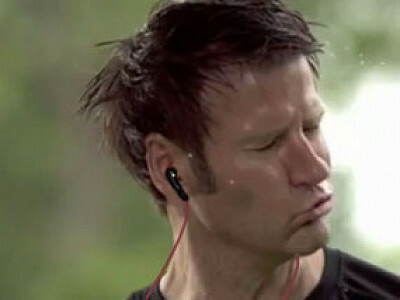 I am pleased to say, not one time did I have to adjust the yurbuds. They fit snugly in the ear and kept the sweat out. Sound was very good (turned the volume down from my normal buds)...I am thoroughly pleased that my 6 year search is finally over. These go from running to weight bench, perfectly. My only complaint is that they fit so well...you can hear the cord rub on your shirt, but once I started running, this went away. Now I need another pair for traveling. Sitting in my drawer, useless now... nike vapor, nike flow, Sennheiser MX-85, iPhone buds, phillips over the ear, Shure, Sony in-ear, JVC over-ear...and a few more I handed down to my kids. @Brian Clemens: Wow, Brian, hats off to you for being so persistant to find a pair that works for you. We knew the Yurbuds were a great problem solver, it's great to hear that a customer agrees with us, especially someone who's tried them all. We're happy we could share their story with you, and that they're your new go-to headphones! The Yurbuds Ironman Series Earphones are sweat proof and water-resistant, so they will hold up even during your most intense workouts! Will they stay in when I'm chewing? I eat on the run, on horseback, backstage on film stages, or on a phone call, and chewing always pushes the stupid things out of my ears. Will these earphones stay in? @Nicholas Krall: What a great question! I will send it on to Daniel and see what he says. @Nicholas Krall: Though I have never tried eating while on horseback and wearing Yurbuds, we can assure you that Yurbuds stay in no matter the activity. I have eaten many meals without them budging, so pet-peeve beware...here come Yurbuds! HI I have been using my earbuds and really like them. they don't always stay in but they do much better then others i have tryed. I am wondering is there a way to "fix" them. I went to use them and the left one does not work?? :( hope you can help if your wondering how long i have had them, that would be 6-9 months. @lori: Glad the yurbuds stay in place better for you. We're sorry the left one is not working properly. Our Customer Support Team will be in touch with you directly to look into it. Sick of headphones that fall out, hurt, or need constant adjusting? So were Seth Burgett and Richard Daniels, founders of Yurbuds. Seth is an avid triathlete, and Richard has completed more than 20 marathons. After too many workouts distracted by the pain of ill-fitting earbuds, the two partners started studying the shape of human ears and working with audiologists so they could develop just the right ergonomic forms to comfortably and securely fit a range of sizes.